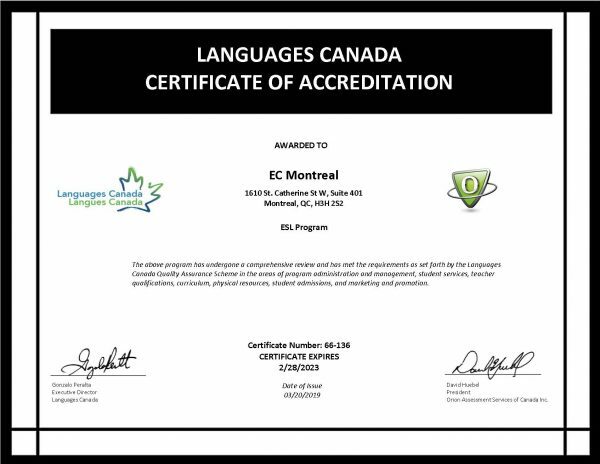 EC Montreal Aces the Languages Canada Audit! EC Montreal is a member of Languages Canada. This association acts as the voice of the Canadian language training sector and its mission is to promote quality, accredited English and French language training in Canada, both nationally and internationally and to represent Canada as the number one destination for quality English and French language training. Every four years, schools are re-evaluated and must undergo an inspection to ensure they are upholding the many quality assurance standards set forth by Languages Canada. In late January, EC Montreal’s English and French programmes were audited. They looked at all areas of the centre including academics, accommodation, administration, activities, marketing and our junior programmes. EC Montreal successfully demonstrated that we are operating our school according to the standards and guidelines of Languages Canada. The inspector was blown away by our operating procedures, our centre facilities and the incredible language ability of our students. She met with a group of students of different ages, backgrounds and nationalities and could not believe how well they were able to express themselves and communicate. EC Montreal is one of many EC locations around the world. The head office is in Malta. The documentation did demonstrate all the criteria to be in conformance with the standard. The school’s location is very good being on Ste-Catherine Street in Montreal and near Concordia and McGill Universities. It is directly downtown and near the Old Montreal area. They are near the great cultural places in Montreal for all the outside activities and near all the Montreal outside festivities. Students and the actual teachers speak very positively about the school. They are very happy to see the quality of the language teaching in the school. The management team is working very hard to keep a good number of students and the results are good. I found that all the management group and the support staff to be very friendly, professional and hardworking. They are completely committed to the student success. The teaching staff is very much respectful of the management’s hard work. I was very impressed with the quality of the English and French speaking of students during the student focus group. The level of support from the parent institution is very high. Head office performs regular intensive internal audits and all the schools are closely monitored with KPI’s. Montreal’s school is very highly rated. The Montreal campus also received an official permit from the Quebec Camp Association. This is a very good recognition of the level of quality of the junior program. I noticed that the documentation is very detailed with all the necessary level of depth to assure an excellent control of all the school’s operations. The teacher’s orientation and evaluation is impressively done with very high quality. EC Montreal received its congratulatory letter today as well as our new ESL and FSL accredited certificates that we have hung proudly in our reception area. Booking an FSL or ESL course with EC comes with a guarantee of quality education and high standards in all our service areas! Contact us for more information on learning English at EC Montreal.